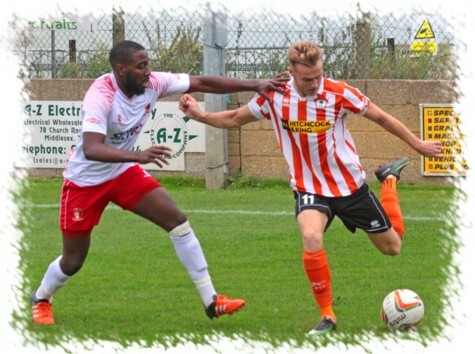 Saturday’s trip to The Robert Parker Stadium to face high flying Ashford Town saw United on the wrong end of a 4-0 scoreline, helped in a small part by a couple of contentious decisions from the officials that saw two United “goals” chalked off. 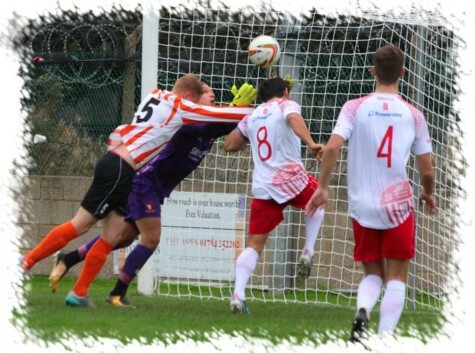 Manager Paul Hughes was forced to make a change between the sticks with Jack Smith not fully fit, and his back-up Luke Daley unavailable, new signing Dimitris Kyriatzis was thrown in at the deep end. Outfield, Rohdell Gordon returned from illness, Matthew Hall was again available and the returning Toby Little took a place on the left side. Things could not have got off to a worse start for United as with just four minutes played, Jack Beadle was given far too much time and space as he moved across the field from the left, the winger then unleashing a low drive that flew into the bottom corner beyond the reach of Kyriatzis’s despairing dive. Just three minutes later though United looked to have levelled the game, Matthew Hall played the ball forwards into the path of Duncan Culley, the striker beating the on-coming ‘keeper Tyler Tobin to the ball and lofting the ball goalwards, Manny Duku who appeared to sprint from behind Culley when the ball was struck raced in on nodded home before the defender could get back. With fans and players celebrating and no signal from the officials everything appeared good with the goal until the assistant raised his flag for offside some 20 or more seconds after the ball hit the net, to the disbelief of all in red & white. United pushed on again after this cruel blow, Toby Little broke past Romario Jones on the left, his centre was controlled by Duku and volleyed goalwards, forcing a good diving save from Tobin who pushed the ball away to safety. Almost immediately at the other end Kyriatzis was again tested, this time the 18 year-old United stopper doing well to hold a deflected Alex Fisher drive. With just 13 minutes played Danny May almost scored the goal of the season as the defender received back his own blocked pass and volleyed the ball goalwards from 40 yards, with Tobin off his line, the ball cleared the crossbar by a matter of inches. After an end to end opening 15 minutes the remaining 30 offered little in the way of clearcut chances apart from in the 27th minute when Daniel Fleming outpaced Orlando Rodrigues on the left, his centre picked out Beadle who thumped the ball past Kyriatzis into the roof of the United net to double the advantage for the home side and that’s how we went in at the break. United came out in the second half looking like a team already beaten which is unusual for Paul Hughes’ side and just three minutes in the home side would have had a fourth but for a superb point blank save by Kyriatzis who managed to get a strong hand to Russell Canderton’s effort with a combination of ‘keeper and Spyros Mentis then hooking the ball away off the line. 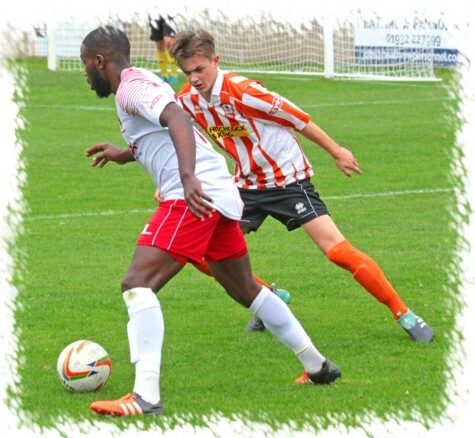 With less than an hour played though the home side did strike again and as with Tuesday nights defeat at Kempston, United showed their frailties at set pieces, Max Webb rising at the far post to head home a deep free-kick from the left side. Again two minutes after conceding, United had the ball in the Ashford net, Culley broke through, Tobin went down for the ball and appeared to collide with his own defender, the loose ball ran to Culley who rolled it home only to be denied by the assistants raised flag saying the striker had committed a foul which from my vantage point I could not say the decision was right or wrong but it just about summed up United’s day. The sad outcome for the home side from the clash was that Tobin was forced to leave the field with a facial injury to be replaced in goal by central defender Canderton, it goes without saying that we wish Tyler Tobin a speedy return to action. With the home side now having a defender in goal, the sad reflection on the United performance was that in the 30 minutes he was in goal, he was not really tested once, in fact all of the attacking play came from the home side. Fleming went close with a 20 yard free-kick and then from a United corner, the ball was quickly played up the field to Beadle who got his shot away looking for a hat-trick but was denied by Kyriatzis who was down quickly to save. As the watch struck 90 and 9 additional minutes were announced, Fleming had another shot on goal that was initially deflected in the air, the ball dropped nicely to Alex Fisher who fired in a volley that Kyriatzis did very well to tip around the post, in a decision that pretty much summed up the officials inconsistent performance all afternoon, a goal-kick was awarded!! The home side did have the last say in the game though as United were yet again undone by a dead ball, this time Fisher floated in a free-kick from the middle of the park, Webb again rising first to flick a header over Kyriatzis to just about finish off “a very bad day at the office” for United.